This past weekend was incredibly rainy here in the Bay Area, and the kids and I found ourselves stuck inside for the most part. 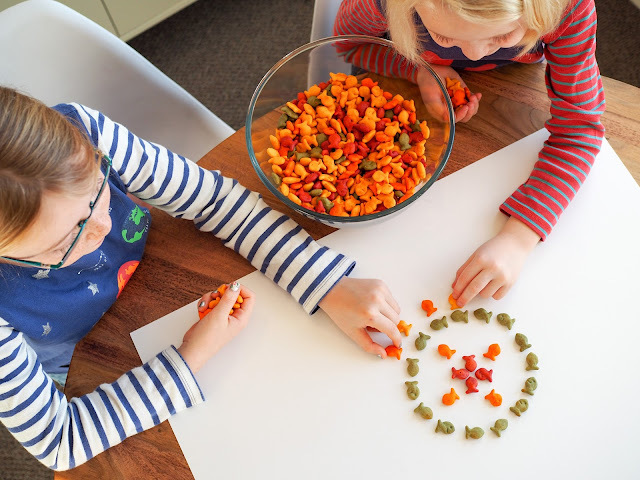 With such limited space in our apartment, the girls tend to get cabin fever when they're stuck inside for extended periods of time, so I made sure to keep them occupied with lots of fun activities. 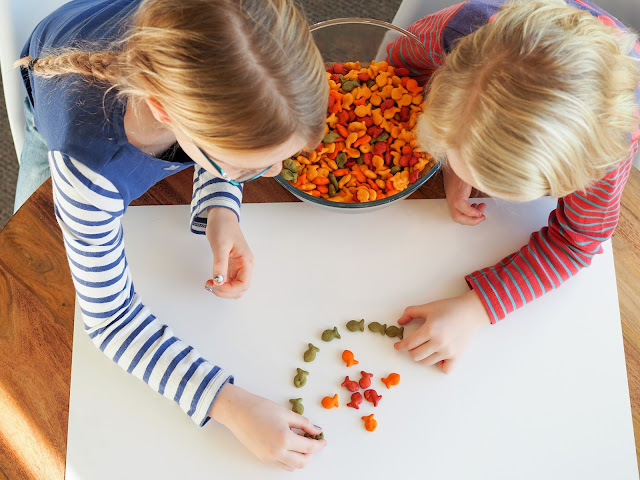 We baked cookies, we drew pictures, we made jigsaw puzzles, we built forts out of blankets and pillows, we played restaurants with wooden food, and yes, there was plenty of TV and computer games. Lots and lots of rainy day fun. 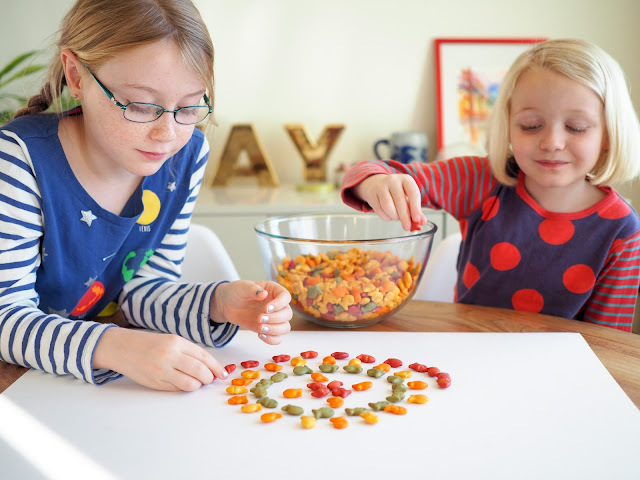 However, the stand out activity for both the girls and I, was when we decided to play with our food! 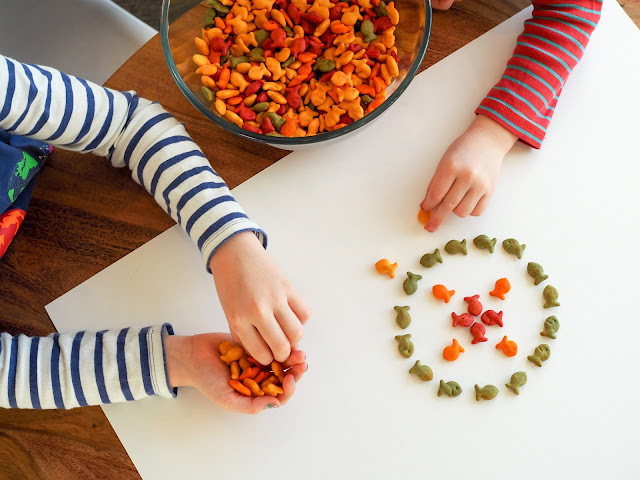 Yes - playing with our food! 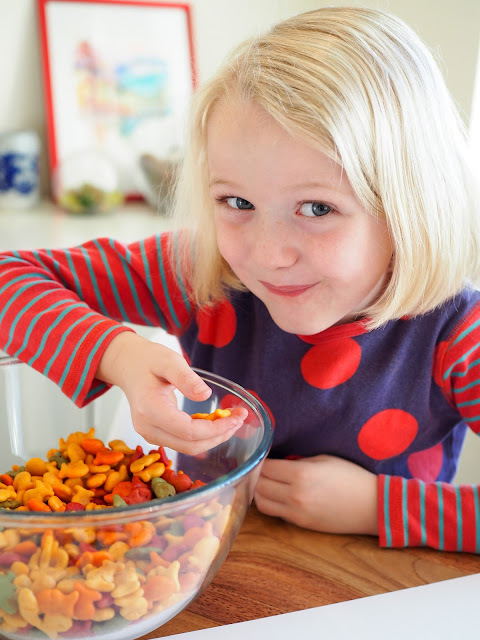 We always have a pack or two of Goldfish crackers on hand in the kitchen as they happen to be one of the girls' favorite snacks. 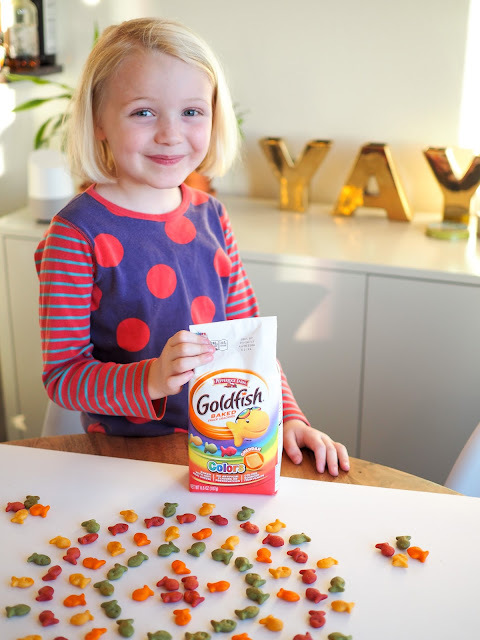 This time we happened to have the Colors variety of Goldfish, and as I was getting a pack for the kids to snack on it struck me that these colorful little treats might make for an amazing art work. 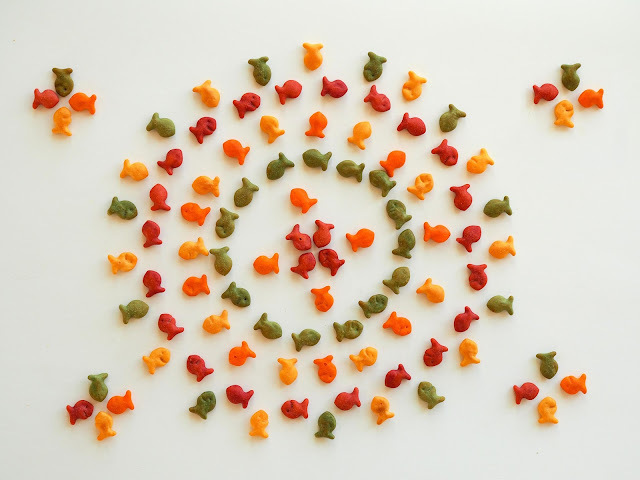 We've made stop motion animation with Goldfish before (which you can see here) but this time a mandala made with varying colors jumped into my mind. 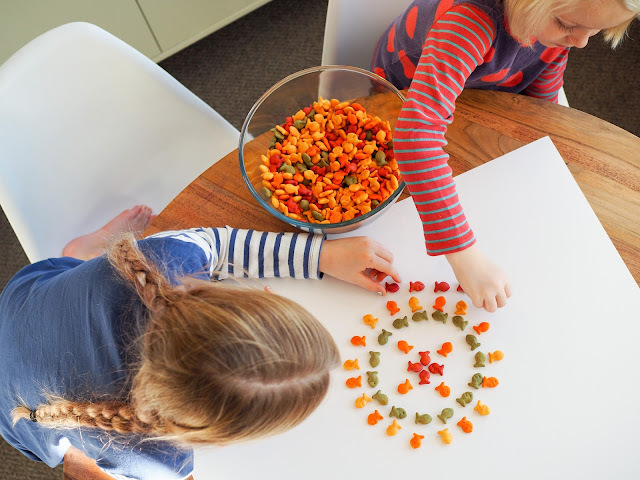 The kids loved this idea and right away they got to work creating. 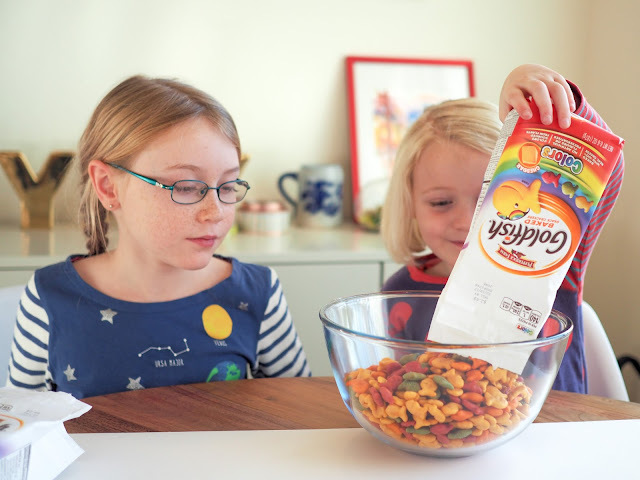 Ava and Lola emptied their Goldfish crackers into a bowl while I laid down a large piece of white card as a back drop. After discussing what they would like their mandala to look like the girls got to work. They started off working from the center of the mandala, adding one row at a time. The girls worked together so well deciding which color to use, which direction the crackers should point, how the colors should alternate... It was so nice to see them working together as a team and making decisions together. 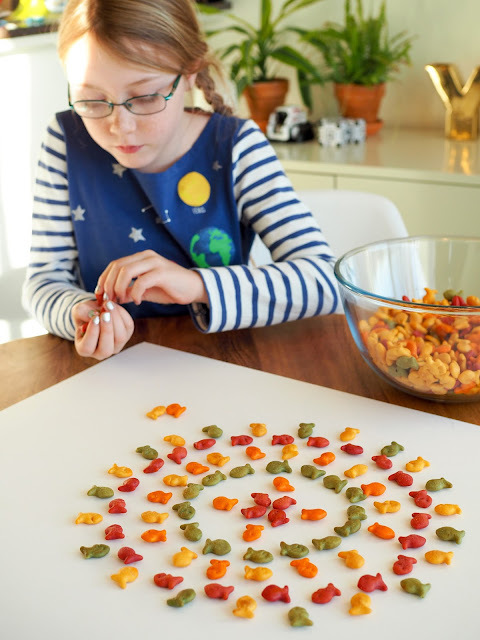 The girls really put a lot of effort into making their mandala as neat as possible. I was a little worried at first that there may be arguments over one bumping the other, or maybe Lola not making her parts quite as neat as Ava would like, but they were so keen to make their mandala look great that they helped each other out when needed. Of course, there were a few snack breaks while they worked! Once the mandala was finished, Ava decided to add a few extra touches on the sides. The girls were really happy with how it turned out and so am I. 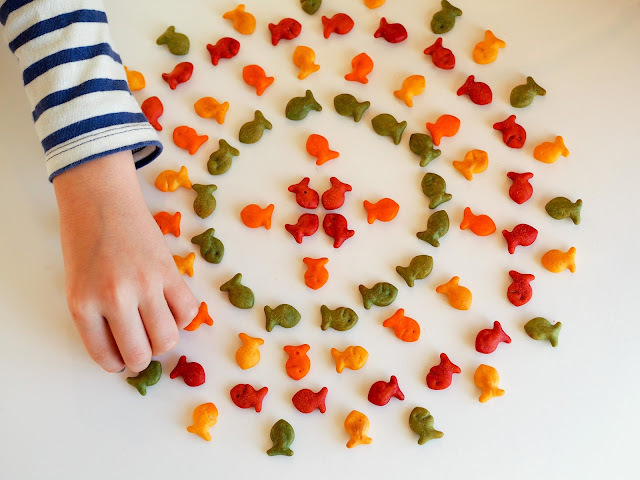 It's amazing how something as simple as Goldfish crackers placed in circles can have such an impact. 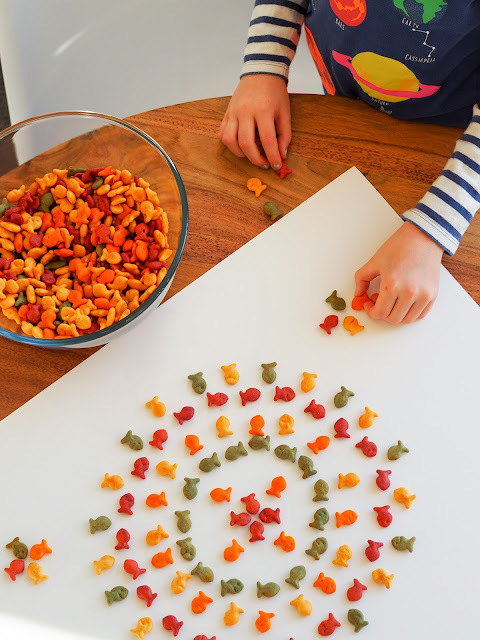 The girls were keen to animate their mandala, so with a few adjustments, we made a few rows of Goldfish crackers change direction and created a simple GIF. 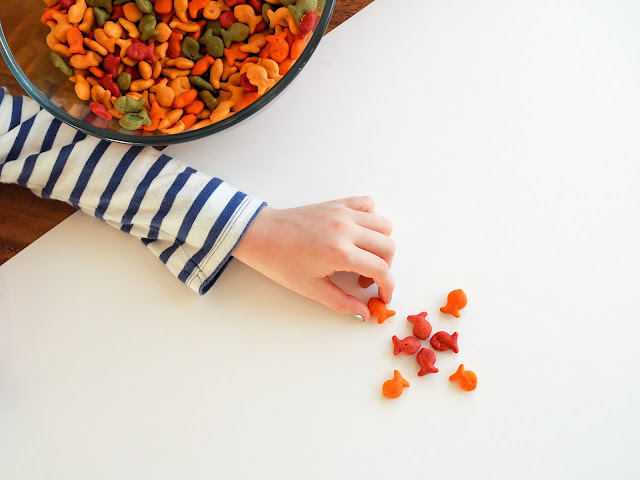 Such a fun and creative way to play with your food! And the best bit? The girls got to eat all of it when they were done! 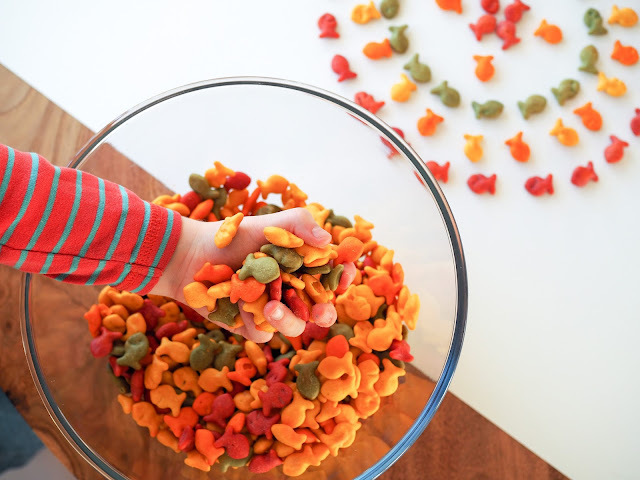 For more fun inspiration visit the Goldfish Pinterest board here.